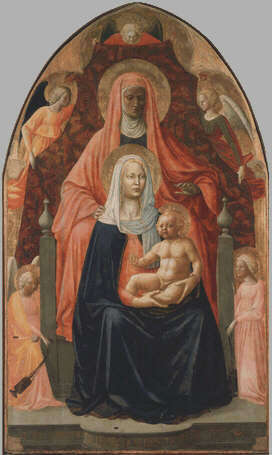 Sant’Anna Metterza means in the ancient Italian language Saint Ann put in the third position and that is in fact the disposition of the main figures in this painting: first comes Jesus, then the Virgin Mary and, third, Anne, Mary’s mother. This painting reveals what happened in the Florentine “botteghe” (workshops): the same work of art could be painted by more than one artist. This is the case here: Masolino and Masaccio painted it for the Church of Sant’Ambrogio in Florence round 1424. The importance of this painting relies mainly on the fact that it shows both the ancient style linked to the Gothic tradition in the way Masolino painted Saint Anne, and the more "modern" way of perceiving volume recognizable in the way Masaccio painted the Virgin Mary.